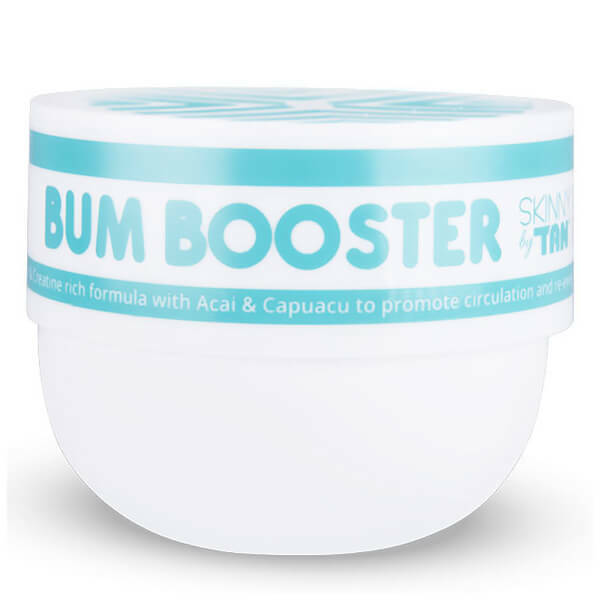 Promote a smoother, firmer-looking silhouette with Bum Booster by SKINNY TAN, a nourishing formula enriched with a host of skin-loving ingredients. Utilising powerful ingredients from nature, including Guarana, Acai and Capuascu, the Caffeine and Creatine-rich formula helps to tone the look of skin, encouraging a smoother, firmer-looking bum. Can also be used on other targeted areas of the body, such as the upper arms and outer thigh. Infused with an exotic Coconut and Vanilla fragrance. Apply on clean, dry skin. Massage into your bottom in a clockwise, circular motion to improve absorption and circulation. Can be used across the whole body or in targeted areas such as upper arms and outer thigh. Apply daily or as often as required to maintain the desired effect. Note - this product does not contain any tanning active. Aqua (Water), Cetearyl Alcohol, Glycerin, Cocos Nucifera (Coconut) Oil, Isopropyl Myristate, Caffeine, Creatine, Glyceryl Stearate, Parfum (Fragrance), Sodium Stearoyl Glutamate, Aloe Barbadensis Leaft Juice, Sodium Polyacrylate, Xanthan Gum Ethylhexylglycerin, Euterpe Oleracea (Acai) Fruit Oil, Theobroma Grandiflorum (Cupuacu) Seed Butter, Triethanolamine, Paulinia Cupana (Guarana) Seed Extract, Citric Acid, Phenoxyethanol, Sodium Benzoate, Potassium Sorbate.